The housing issue is one of the most important items of the Kurdistan Regional Government – Iraq. The Kurdistan regional government has, also in the previous cabinets, focused on pin-pointing the issues and finding suitable solutions regarding the housing sector. Since 1992 numerous works in corporation with other actors, such as NGO’s, UN HABITAT and Kurdistan general investment institution, have been done regarding the housing issues in Kurdistan. However, the Ministry of Construction and Housing (MOCAH) played the most important role in the social housing aspects in the housing sector. MOCAH main focus and its program was the development of social housings for the social classes that were in need of these social housings. For example, families of martyrs, Peshmerga’s or households with low income. The first cabinet of the Kurdistan regional government – Iraq has attempted to solve the housing issues in terms of village reconstructions. After 2005, when the Kurdistan region had an increase in wealth and population, new problems emerged in the housing sector. Therefore, the KRG together with the general investment institutions, through their investments in housing projects, formulated new plans for the housing situation in the Kurdistan region. This resulted in the development and implementation of new laws by the Parliament, such as law number 7 of 2008 and its amendment law number 16 of 2011. The focus of this law is the creation of a budget for social housing in Kurdistan. Furthermore, this law gives the responsibility of developing these social housing to MOCAH. The social housings are developed for public servants and households with low income in Kurdistan. These housings are different from the plans of the general investment institution. According to the social housings plan that were developed by the government, MOCAH was responsible for the creation of 5000 dwellings throughout Kurdistan. For these projects the Ministry received a yearly budget that was made available from the KRG budget. The amount of social housing dwellings that needed to be build were based on the situation and the amount of the households with low income and the amount of public servants that did not own any dwellings. First phase (1992 – 1998), During this period the dwellings in the villages were developed by NGO’s. 41 000 dwellings were constructed during this period. Second Phase (1998-2005); due to UN resolution 986 and UN-Habitat, dwellings were constructed in the Kurdistan region. In total 20 385 dwellings were built under the supervision of MOCAH. Third phase (2005 – 2011); Dwellings were constructed by the general investment institution during this phase. Furthermore, MOCAH also started with some social housings project during the same period. During this period MOCAH was able to build 19 813 dwellings. Fourth phase (2011 – present); Due to law number 7 of 2008 and its amendment 16 of 2011, which allowed for the creation of a housing budget in the yearly budget planning of the KRG, MOCAH was able to finish the construction of 2 354 dwellings. Furthermore 9 436 are still under construction and therefore are not yet finished to be delivered. The social housing dwellings are constructed and financed from the yearly budget of the KRG that has been made available due to law number 7 and its amendment 16 of 2011. However, the Ministry wants to have a more executive role and supervise the implementation of the policies of social housing in Kurdistan for the middle class, public servants and low income households. The Ministry wants to do this with a new model from which the dwellings are built with all the necessary infrastructure and facilities by investors. This must be done according to the guidelines and requirements of the Ministry. According to this model MOCAH will approve detailed plans and the architectural and technical design plans for the social housing projects that are made by any investors who intend to construct housing projects. Furthermore, a team of engineers will be created to supervise the social housings projects with the aim of guaranteeing that the dwellings will be adequately built. This technical supervision will be financed by the investor and it will be 1% of the overall cost of the project. Also to guaranty the design of the site, choosing the location for the project and choosing the correct orientations and area for the necessary infrastructure and facilities that are in accordance with the requirements of the KRG. For this reason, it is required of the investors to have backing from the bank of 5% of the overall project cost during the project period and maintenance period. This is necessary to get approval from MOCAH to develop the housing project. At the same time the price of the dwellings must be determined based on the financial situation of households with low income and the situation of the public servants. The projects cannot start without the approval from MOCAH. Furthermore, the announcement of the project must be in accordance with the regulations that are set by the government. MOCAH will also make a yearly plan and a five-year plan for the housing situation of the chosen social classes that are in need of social housing. Furthermore, the Ministry will make a general housing plan with the necessary facilities and infrastructure for all the different social classes regarding the housing sector throughout the Kurdistan region and will announce these plans. Based on the information that has been provided by the KRG, a five-year plan has been developed on the basis of 5 million persons, which is the population of Kurdistan. According to this amount of population and with the probability that the average households consist of 6 persons, a total of 6000 dwellings for low income household will be required to be built. This number of dwellings is based on the percentage of low income households in Kurdistan, which is 3.8% of the total population in 2013. According to recent data of 2015 the percentage of low income households in Kurdistan has increased to 12.5% of the total population, of which according new calculation the population of Kurdistan has increased to 6.5 million. This increase has mostly been caused by the arrival of refugees. According to this new statistics 120 000 dwellings are required to be built. However, it is important to take into consideration that this new statistic is temporarily and it is should not be used to determine the amount of dwellings that needs to be built. Therefore, if we consider the 3.8 percent of households with low income an amount of 30 000 dwellings needs to be built according to the five-year plan of the KRG. In this calculation it has not been taken into account the increase of young adults and new young households who will also need housing. This will influence the five-year plan for housing in Kurdistan. In total 107 365 families live in rented dwellings, which is 14 percent of the population of the Kurdistan region. Furthermore, the tenants’ association of Kurdistan has 85 000 members. This information can also be used as another basis for the housing sector planning. The statistics that has been provided shows the present situation and can therefore be changed in the future due to an increase in population and in newlyweds who will create their own family. The information and statistics that have been given in this document have been used by the Ministry to formulate a five-year plan for the housing sector in Kurdistan. It is also important to mention the assistance of Dr. Mand Ibrahim Dzay an expert of housing, who worked as a housing consultant for the Ministry regarding the development of the five-year plan for the housing sector. The five-year plan, from 2016 to 2020, regarding the social housing, with the necessary requirements and facilities, is described below in more detail. In total 25,000 to 28,500 dwellings are needed to be built each year, which will be a total of around 135,000 dwellings in a five-year period. The distribution of the social housing projects for the middle class, low income households and public servants will be done in collaboration with the provinces of the Kurdistan regional government. This will be done based on the information and statistics regarding the tenants, citizens and public servants of the districts, sub-districts and the city centers of the large cities of Kurdistan. Furthermore, the information and statistics that has been given will be used in the development of a general plan for the Kurdistan region. Suitable plot of lands need to be chosen with suitable orientations and area within the border of the provinces. The plot of lands that will be chosen for the social housing projects must not be lands that are used for agriculture. Furthermore, the districts and sub-districts will have an important role in the distribution of the dwellings. The necessary demands of the citizens, the dwelling managements, parliament committee and the civil unions must be taken into consideration. This part will focus on the planning and implementation of the social housing dwellings. The methods and mechanisms of implementation and distribution of the social housing dwellings are described below, which include two models of housing projects. It is important to mention that the two models of working will be send to the Ministry for review and approval. The guidelines and the regulations of law number 7 of 2008 and its amendment 16 of 2011 will be followed regarding the implementation and distribution of the social housing dwellings without neglecting any items of the law. This will be done until a new law is implemented. In addition of making the necessary budget available for the housing project, it is also important to allocate a plot of land for the project. The responsible government actors, such as the governorate directorate, must not allow any social housing project to start if a plot of land is not made available for the project. This requirement also applies to new housing projects. New social housing projects cannot be planned if the Ministry of Municipality and Tourism has not allocated a suitable plot of land. When a plot of land is chosen, it is important to take into consideration the topography of the land to prevent any increase in costs of the project. Furthermore, it is also important during the decision process of choosing a suitable plot of land the distance to the city center, the transportation methods and the movement patterns of the future inhabitants of the dwellings. Additionally, when a plot of land is chosen outside of the municipality it is not allowed to choose a plot of land that is suitable for agriculture. When choosing a plot of land and the location of the housing project, it is important to take into consideration the future traffic situation, the amount of transportations for the main roads and the roads around the project area. Moreover, any future urban planning and urban expansions must also be taking into consideration. According to the requirements of the Ministry of Construction and Housing - KRG the typology of housing projects that are located in the city centers of large cities, must be apartments of five to eight floors high and must be constructed with reinforced concrete frame structure. 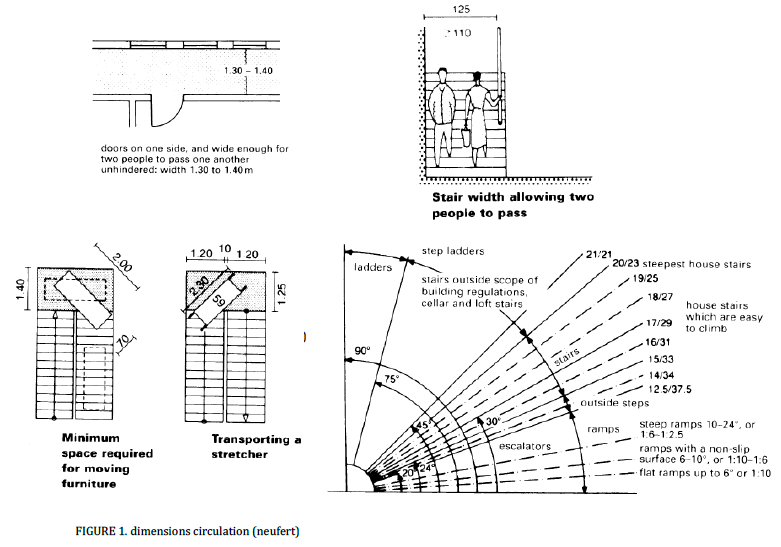 Furthermore, it must also include lifts for the internal circulation of the building. The typology of the housing projects that are located in the districts and sub-districts must be apartments of three floors high and must be constructed with reinforced concrete frame structure. For these apartments it is not required to include lifts. The apartments must consist of two types. The first type of apartments consists of three bedrooms and is designed for household that have five or more members. The area of the apartment of these large type must be around 120 m2. The second type of apartment is suitable for average or small households, which has two to four members. These apartments must have two bedrooms and a total area of around 106 m2. A copy of the design concept and plan has been attached and can be used as guidelines and requirements for the housing projects. This design concept is used as a guideline and an example. Therefore, it is allowed to make a different design for the social housing for different locations. However, the new design must be the same typology and must be within the same budget. The ratio of the large apartments, which has three bedrooms, must be around 30 percent of the project. A simple fence or a barrier must be made around the project area. The costs of this fence/barrier must be included in the costs of the primary infrastructure and public services to prevent an increase of the dwelling costs, which will be paid by the citizens who will buy the dwellings of these social housing project and benefit from these houses. This requirement is stated by law number 7 of 2008 and its amendment 16 of 2011. Houses can be built in the new combined sub-districts that have a large amount of land. However, the allocated plot of land must not be suitable for agricultures. The houses can either be one or two floors on a plot of land of 200 m2 to 250 m2 within a minimum building footprint of 120 m2. The actors who propose these type of dwellings must be able to research and prove that the costs of the plot of land and the dwellings are the same as the typology of the apartments. Also for the houses a copy of the design concept and plan has been attached and can be used as an example, however a different design is allowed if it has the same typology, costs and meets the same requirements. As it has been mention in the guidelines of Urban Housing Standards Manual, each zone consists of 120 dwellings. Depending on the design of the projects, the typology for the dwellings will be apartments with parking area and green area. A neighborhood will consist of four of these zones with all the necessary infrastructure and public services. The creation of these neighborhoods will be the first step before starting with the creation of the sectors and districts. the combining construction costs of the dwellings in the provinces will be done according to what is possible and according to the following type of areas. The public servants or the families with low income, who have purchased the social housing dwelling, must pay the owed money back monthly for a period of 25 years. The amount of money that has to be paid back monthly is determined by the following equation. Monthly cost is based on the total building cost of the dwelling + 1% administration costs. The costs of the necessary public services and the infrastructure, which are located inside the project borders, will not be paid by the residents/citizens. The primary infrastructure that are located outside the project area, such as electricity, water, roads etc., will be financed by the relevant government actors. Therefore, it is important to notify and communicate with the relevant Ministries before the construction of the housings start. This will allow the relevant Ministries to include their tasks into their own yearly plans. The construction of public services, such as schools, a healthcare center, parks, mosque, playground, fire and police station, commercial areas, etc., will be the responsibility of the relevant Ministries. However, the construction of these public services will depend on the necessity of these public services and the type and size of the project. In the beginning of the project it will be evaluated which public services are required and a suitable plot of land and area must be allocated for this public services. The location of these public services must be according to the requirements of the Urban Housing Standards Manual if Iraq. The construction of the dwellings, infrastructure and the public services must be considered as one project and therefore be announced as one project instead of making different tenders. This has to due with the fact that only one company will be allowed to construct the whole project. The importance of this approach is to prevent problems and issues that are created when two different companies work on two different aspects within the same project and site. The Ministry of Construction and Housing will retrieve the payment from the beneficiary citizens. MOCAH will therefore notify the Ministry of Planning and the Ministry of Finance and Economy during the beginning of the construction of the housing projects, which consist of the construction of the dwellings, infrastructure and the public services. Later on the construction of the dwellings, such as apartments, will be financed from the money paid by the beneficiary citizens. However, the construction of the public services will be financed by the KRG. The mechanism for distribution and coordination are mentioned in regulation no.1 of 2012 of the Ministry. However, it is also necessary to take the following recommendation into consideration. The selection of beneficiary names must be done through the process of forms, which are distributed from a committee that consist of members from several government agencies. These members are from MOCAH, Governorate offices and statistic directorate. This must be done after a list of the potential beneficiary have been created for public servants and other citizens. This list of names is finalized after it has gone through the first filter of the selection process, which takes place in the Governorate offices. This list of names must go through all the different government offices that are related to the built environment and through the different Governorate offices. This must be done to prevent repetition of the same beneficiary names. According to the regulation of the governorate districts and local administration a committee must be formed by the beneficiaries after the completion of the apartments. This committee will help with the management of the apartments and manage the maintenance and services of building, the lifts and if necessary the maintenance and service of the generators and electricity. The beneficiary citizens must make a monthly payment for the housings that they have purchased. Through administrative orders a committee will be created in each directorate of MOCAH in the provinces where the housings are constructed. This committee, which has the responsibility to receive and collect this payment, must change its members two times every year. This committee is necessary until a banking system is created for the payment of these housing projects. Therefore, each directorate will open a bank account to deposit these payments and it is important that this bank account is only used for this purpose to prevent problems regarding accounting. Due to the requirements that are mentioned above, the creation of a suitable location is necessary to facilitate the process of receiving the payments and the inspection of the specifications of the distributed dwellings. Furthermore, to implement the law items regarding the housing fund (law number 7 of 2008 and its amendment law number 16 of 2011 and the regulation number 1 of 2012 of the Ministry of Construction and Housing). Therefore, for each project an apartment must be dedicated for this purpose. Every beneficiary citizen or public servant, who have received a dwelling according to the regulation, must submit a written statement before receiving the dwelling to the relevant directorate of MOCAH. In this written statement the beneficiary citizen or public servant agrees to not make any changes or adjustments to the building. According to the regulations the governorate offices will consider a citizen as a low income citizen when certain information and documentations have been provided. First of all, this citizen must have two legal witnesses. Furthermore, acknowledgement by the representative of the neighborhood for the residential address. Other documentation that must be provided are Identification papers, food support card and acknowledgement from the directorate of family welfare. Moreover, the citizen must provide a witness that has been acknowledged by a solicitor to proof that every information and documentation that has been provided is true and correct. The main requirements for permitting any housing project to start is the availability of the necessary budget and land. First of all, the housing project also include the primary infrastructure such as the creation of water pipes for drinking water, sewage, roads and electrical grid. An investor is allowed to allocate a suitable land for the housing project. However, if a plot of land has not been provided by the investor or the government for the housing project for low income households or public servants then the project is not permitted to start. It is important during allocating a suitable plot of land to take the topography of the land into consideration to prevent an increase in the construction costs of the project. Furthermore, it is also important to take into consideration the distance of the projects location to the city center and the transportation methods of the future inhabited. Additionally, when a plot of land is chosen outside of the municipality it is not allowed to choose a plot of land that is suitable for agriculture purposes. When choosing a plot of land and the location of the housing project, it is important to take into consideration the future development of the traffic and the traffic volume for the main roads and the secondary roads around the project area. Moreover, any future urban planning and urban expansions must be taking into consideration. The housing projects of the districts and sub-districts must be three floors high apartments, constructed with reinforced concrete framing. Due to its low height it is not necessary to include lifts. The apartments must consist of two types. The first type of apartments consists of three bedrooms and is designed for household that have five or more members. The area of the apartment of these large type must be around 120 m2. The second type of apartment is suitable for average or small households which has two to four members. These apartments must have two bedrooms and an area of around 106 m2. A design concept is included with the guidelines and requirements for the housing projects. This design concept is used as a guideline and an example. Therefore, it is allowed to make a different design for the social housing for different locations. However, the new design must be the same typology and must be within the same budget. Furthermore, it must also be in accordance with the same regulation and requirements. If it is required a simple fence or a barrier must be made around the project area. Houses can be built in the new combined sub-districts that have a large amount of land. These houses can either be one or two floors on a plot of land of 200 m2 to 250 m2 within a minimum building footprint of 120 m2. The investors who propose these type of dwellings must be able to research and prove that the costs of the plot of land and the dwellings are the same as the typology and costs of the apartments. Also for the houses a design concept attached that can be used as an example, however a different design is allowed if it has the same typology and costs and meets the same requirements. The payments for the houses from the citizens, which are low income citizens or public servants, must be done in the following method: the advance payments for the houses must be 50 percent of the total cost of the dwelling with the primary infrastructure and public services. This 50% will be paid in three payments. The first two payments must be 20% and the last payment must be 10%. This payment will start when the implementation ratio of the project is around 50% to 70% and when the key of those houses has been handed over to the beneficiaries. The remaining amount of money will be paid back in a period of five years or more. As it has been mention in the guidelines of Urban Housing Standards Manual, each zone consists of 120 dwelling. Depending on the design of the projects, the typology for the dwellings will be apartments with parking area and green area. A neighborhood will consist of four these zones with all the necessary infrastructure and public services. The creation of these neighborhoods will be the first step before starting with the creation of the sectors and districts. The constructed costs of the primary infrastructure such as sewage systems, drinking water, electricity and the internal roads of the project will be financed by the investors and must be in accordance to the standards of the relevant government actors. This main infrastructure lines must be constructed in such a way that they can be connected to the main infrastructure outside of the projects. The costs for connecting these infrastructures will be financed by the investor. These main infrastructures are sewage, electricity and drinking water. Furthermore, for a period of one year any maintenance to the infrastructure of the project will be the responsibility of the investor. In the plan of the project the penalty must be included for when the project is delayed. Regarding the other public services (schools, medical facilities, parks, playground, religion center, business and shopping center etc. ), it will be facilitated by the relevant government actor depending on the type of the project and the necessity. Therefore, it is important that a suitable plot of land is allocated for these public services in the masterplan, which will be the responsibility of the investor. the investor must create housings with the required quality and low costs. This low cost will depend on the economic situation of when the houses are being constructed. Furthermore, the investor must also provide all the necessary and primary infrastructure and public services under the supervision of the building engineers from MOCAH. In return, the investor is allowed to make profit from 25% of the dwellings. This will also allow for the mixture of different social classes living in the same neighborhood. The investor is also allowed to make profit from the plot of lands that are allocated for business and shops that are within the site plan of the project. However, the investor must first get permission from MOCAH and permission from the relevant governorate offices, municipalities and other relevant actors. the mechanism for distribution of the remaining 75% of the dwellings will be done by the government through the use of name lists. The distribution and coordination will be in accordance to regulation number 1 of 2012 of MOCAH and must also be in accordance with the following points. The selection of beneficiary names must be done through the process of forms, which are distributed from a committee that consist of members from several government agencies. These members are from MOCAH, Governorate offices and statistic directorate. This must be done after a list of the potential beneficiary have been created for public servants and other citizens. This list of names is finalized after it has gone through the first filter of the selection process, which takes place in the Governorate offices. This list of names must go through all the different government offices that are related to the built environment. This must be done to prevent repetition of the same beneficiary names. The investor companies must do an independent research regarding the requirements for the dwellings. This must be an academic and technical report, which together with a project proposal must be submitted to the ministry. The beneficiary citizen must make a monthly payment for the the dwelling that has been bought. A contract must also be drafted and signed by the investing company and the beneficiary citizen. This contract must then be approved by MOCAH. For this reason, the regulation of real estate bank can be used. This will mean that a bank will coordinate between the citizen and the investor. The investor is allowed to submit recommendations and proposal to the Ministry. These recommendations can either be approved or rejected by the Ministry. It is important that the designs of the dwellings are similar for all the local administrations of the Kurdistan region. The designs must have the similar requirements, organization and typology. Furthermore, the following regulations regarding the design are the same for the housing projects that are funded by the government or by an investor. Moreover, they are also compulsory for both models that are mentioned above. The site plan of the project must be in accordance to the requirements of the second item and the documentation of the Urban Standard Housing Manual, which has been formulated by the Ministry of Construction and Housing of Iraq. The housing projects will be reviewed by a specialized committee of MOCAH before it can be realized. The housing project can only start when it has received approval from the specialized committee of MOCAH. every apartment must have a balcony with a suitable dimension. It is necessary to provide adequate and safe circulation inside the buildings that are in accordance with the following requirements. First of all, the minimum width of the corridors must be 1.3 meters and the landings of the stairs must have a minimum width of 1.4 meters. Secondly the maximum angle of the stairs must not exceed 37 degrees. However, the most optimum angle for the stairs is 30 degrees. This is necessary to guaranty the movement of people and furniture. More information can be found in figure 1. It is important to use ramps in areas that don’t have access to an elevator. An example is stairs outside the building. When a ramps is being used, it is important to have a height and length ratio of 1:10 m.
For every apartments building a minimum of two lifts is required with a minimum loading capability of 1000 kilos to ensure the movement of furniture and allow access to stretchers. Furthermore, these lifts must also have ventilation. More explanation can be found in figure 2. All the buildings must have thermal insulation in the building skin. Furthermore, the exterior walls must be made of bricks or thermal stones and a two-layer cement player must be applied on the interior and exterior side of the exterior walls. For thermal insulation types XPS, EPS and PUR are recommended and approved to be used. The use of thermal insulation is necessary to achieve a low U-value and must be in accordance to the regulation code 501 of Iraq. Every project or plan must be in accordance to this requirement to get approval for execution. Furthermore, other types of thermal insulation are allowed if they have the same properties and have international license and must be confirmed by a supervision committee. Fire safety is one of the most important requirements and approval for the project cannot be given without the implementation of fire safety. The following three items must be considered when the fire safety is implemented in the project. Firstly, it is the use of a detection and alarm system for heat and smoke. Secondly the use of an extinguishing system and thirdly it is the use of fire compartmentation in the design. 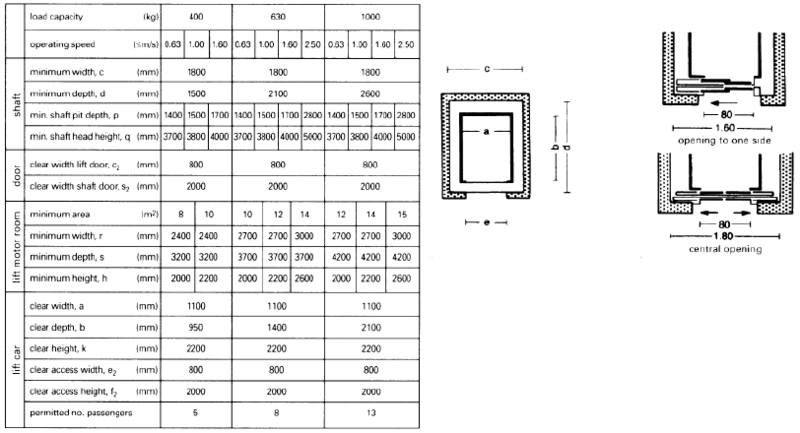 The area of the fire compartmentation must be between 1000 m2 to 2000 m2. Furthermore, the walls, doors and windows of the fire compartmentation must have a minimum of 30 minutes of fire resistance. Furthermore, it is important to have emergency stair cases in the buildings, emergency exit roads inside the project area and the use of suitable symbols. 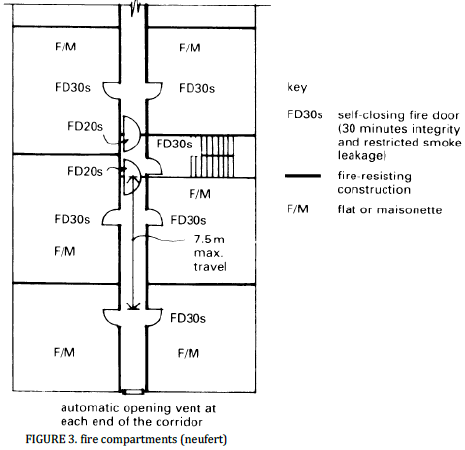 Further explanation for fire compartmentation can be found in figure 3. It is important and recommended to make use of photovoltaic panels for generating electricity. Projects that make use photovoltaic panels will get more points during approval process. During the evaluation of the masterplan of the housing project, it is important to take into consideration green building strategies and learning from international examples. An important aspect of green building strategies is the use of green inside the project area. This can be the planting of trees at the middle of the roads and in the green areas. The use of green requires a sophisticated watering system to maintain the quality of the green areas. Due to the importance of green, for every plot of land of 200 m2 a minimum of 50 m2 must be green. Furthermore, it is also important to use strategies during the design that allows for natural ventilation for the housings to provide a healthy living environment. the housing project will have two type of apartments. The first type of apartments is the two-bedroom apartment with an area of around 106 m2. This type of apartment is for medium to small households. The second type is the three-bedroom apartment with an area of around 120 m2 and is suitable for large households. Furthermore, the minimum width of the rooms is 2 meters and the minimum length is 3 meters. The minimum dimension for the toilet is 0.9 m x 1.2 m and the minimum dimension for the bathrooms is 1.65 m x 1.2 m. Moreover, the minimum floor height is 2.5 meters. In general it is allowed to have a deviation regarding the area of the apartments, depending on the requirements and necessities of the design and the projects. However, this deviation must not exceed 5 to 10 percent. the amount of green must not be less than 20% of the overall area of the project. If it is a housing project, then this minimum required does not include the garden areas of the houses. Furthermore, a timing watering system for the green areas must be used in the project. the amount of open area of the project most not be less than 40% of the overall area. This percentage also includes the green areas. For every 500 dwellings the following public services must be available: one primary school, one secondary school, a medium size medical center and a religion center (Mosque/church). drinking water will be made available upon the approval of water directorate. For every inhabitant of the project 200 litters of drinking water must be made available. plot of lands for public services that are related to youth activities must be allocated in the site plan of the project to allow in the future the possibility for this buildings to be constructed. These public services are a sports ground and swimming pool and a place where music activities can take place. in the site plan suitable plot of lands must be allocated for the general public services and these plot of land must be untouched and unchanged to allow in the future for the construction of these public services. The general public services are a police center for police officers and park rangers, government offices, schools, medical center, etc. The circulation inside the project must be made in such a way that it allows the movement of traffic in a safe and easy way and connecting the streets with the main roads. Furthermore, there must be a suitable car park that provides sufficient space for the inhabitants of the apartments and the houses.